Hope. Bravery. Courage. These are all inspiring messages from Director Gabriel Riva Palacio’s latest film, Un Gallo Con Muchos Huevos. A story about Toto (voiced by Bruno Bichir), who was born the outcast of the litter. However, when a chance encounter with an evil rancher threatens to destroy Toto’s home and family, he musters up the courage to go from a young “chicken” to a brave rooster. “I love the message in this film and in the Palacio brothers’ previous films,” said Bichir, who was in Chicago Tuesday afternoon at The James Hotel meeting with the press. “This is a film that has such a wonderful message, which is everyone has an undeniable inner strength. 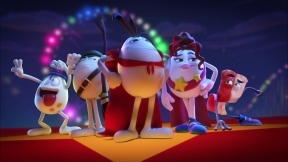 All you have to do it believe in yourself and have the courage to stand up for yourself.” Un Gallo Con Much Huevos, voiced by Angelica Vale, Maite Perroni, Omar Chaparro, Ninel Conde, and Carlos Espejel, takes movie goers on a journey of self-discovery with the help of vivid imagery and wonderful storytelling. “You don’t necessarily need a big budget to have a great movie,” said Bichir. “All you need really is a strong message, one that people from all walks of life can relate to and that’s what Un Gallo Con Muchos Huevos is all about.” As for upcoming projects Bichir is currently involved in is Netflix’s latest hit, Narcos about the seedy and perilous world of Pablo Escobar. “I am enjoying being part of a story that is gritty and dangerous and eye-opening. It has been an amazing experience being a part of Narcos. 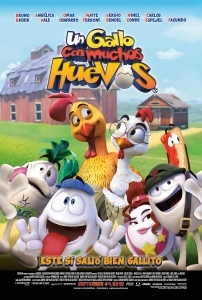 I am fortunate to be able to work with amazing people who have amazing stories to tell.” Un Gallo Con Muchos Huevos hits theaters on September 4th.